I am very excited. 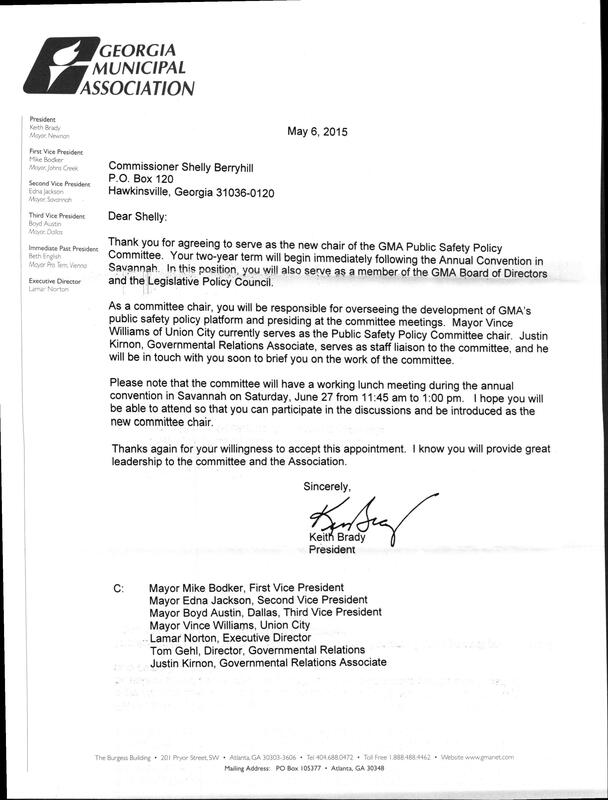 I have been asked to serve on the GMA (Georgia Municipal Association) Board of Directors AND serve as Chairman of the Public Safety Policy Committee. One of the reasons that I ran for the City of Hawkinsville Commission was to be able to promote Hawkinsville. Promote its strong points to our own citizens AND promote it state wide. This position gives me another outlet to do just that! GMA does an excellent job of lobbying the state lawmakers on behalf of ALL cities in Georgia. As Public Safety Committee Chair, I will be intimately involved in helping GMA dissect proposed legislation and how it effects Hawkinsville and other cities across Georgia. Too often, a law is passed without the full ramifications being understood. By diving into the details of a proposed law BEFORE it becomes law, we can hopefully get the author of the legislation to change its wording (or drop the bill entirely) if a negative effect on our cities would be the result. GMA has a great track record in their lobbying efforts. I am very excited about being able to help. Thank you GMA for this honor! Wow, It really worked. My previous posts asking for persons willing to serve on our boards paid off. I got two responses and BOTH of them were appointed to boards during tonights City of Hawkinsville Commission meeting. Clif Pritchett was appointed to the city’s Planning and Zoning Board and Milton Sutherlin was appointed to the Hawkinsville Urban Redevelopment Board. It is great to have citizens WANTING to serve this great community. My hats off to you guys!!! The City Commission of Hawkinsville has several boards and authorities that currently have vacancies. If you live within the city limits (a legal requirement) and would be interested in serving the citizens of this community, let me know. and many others. Again, we need volunteers, so if you are interested, let me know…..